Last week I picked about 300g of raspberries every day! There are still lots to come, so we have been eating many of them fresh as desert, those that remain I have frozen in the hopes that I’ll have enough to make some jam. I thought I’d share some recipes with you. 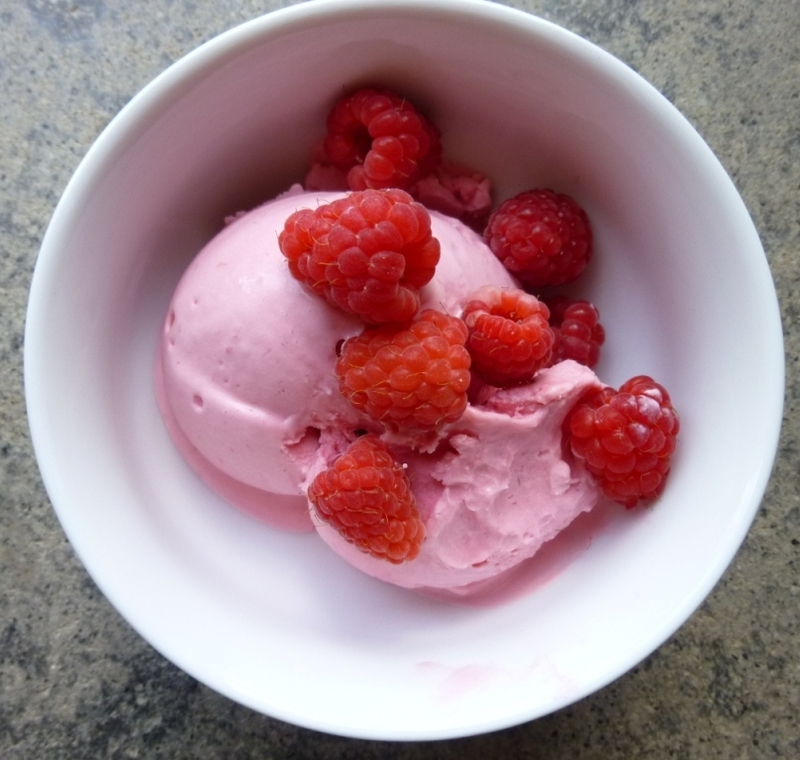 Today I have made raspberry ice cream. Process the raspberries quickly in a food processor and strain the purée. Mix the raspberry purée with the lemon juice and sugar. Chill for about 2 hours. Pour with mixture into an ice-cream maker for about 20 minutes (follow the instructions for your machine). You can also make it without an ice-cream maker by pouring the mixture into freezer trays and still freeze, beating the mixture once or twice during freezing. Last week I made Panna Cotta a couple of times; once to take to John the Baptist’s dinner and once for a small dinner party for 8 on Friday. Both times I served raspberries with the Panna Cotta but really a coulis of raspberries or blackcurrants is best with maybe just a few fresh fruit on the side. This recipe is a combination of recipes by Rick Stein and Delia Smith. Split the vanilla pod and scrape the seeds out of the pod. Put both the pod and seeds into a small pan with the cream, milk and sugar and simmer gently for 5 minutes, then remove from the heat. Soak the leaves of gelatine in a bowl of cold water for 5 minutes, allowing it to swell. Remove from the water and squeeze to remove excess liquid. Remove the vanilla pods from the cream and add the gelatine to the warm cream mixture and stir to dissolve. Pour into 6 dariole moulds, individual pudding basins, or ramekins, cover and chill for at least 3 hours or until set. I also doubled the quantities and used a loaf tin to make this. It then needs a little extra gelatine or longer to set to cope with the increased volume. De-stalk the black currants (if using). Put the fruit into a food processor and process quickly then rub through a sieve. Add the sugar, stir until well amalgamated. Unmould the panna cotta onto serving plates and pour a little coulis around the base. Add a few fresh raspberries to each plate. If making the larger version; cut into slices and serve as above. 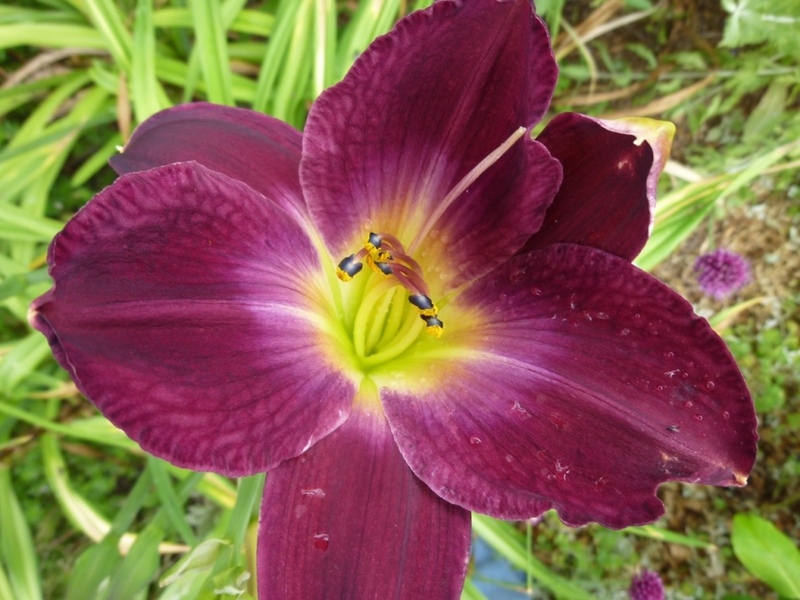 It’s great when flower colours actually come out as you expected when choosing plants from books or on-line. I wanted the this area of the garden to be full of burnt orange to glow when the setting sun hits them. Planted nearby are a pomegranate, also with orange flowers and Physocarpus Diabolo which has purple foliage that looks amazing with orange nearby. The tall Hemerocallis, above, is also planted in the back border to compliment the colour of an abutilon that I have there. 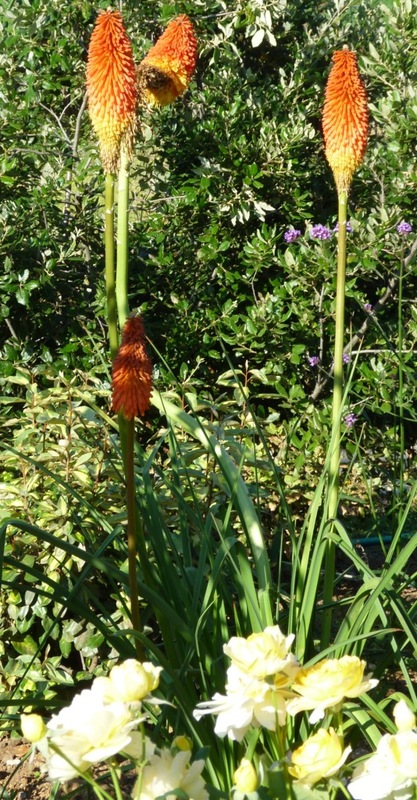 Also close by is a wonderfully bright kniphofia (I don’t know the name as it was a gift). I would like to plant some more purple foliage plants with these. Any ideas for drought tollerant plants would be appreciated. No morning wash is more glorious than that of Italy’s rural people on the morning of June 24th. On June 23rd at sunset, eve of the Festa di San Giovanni Battista, women head out into the fields to gather cento erbe (literally,”one hundred greens or plants”, though flowers as well as plants are picked). These will then be soaked all night in a bowl outdoors; they must never enter the house. Keeping the basin out all night assures that the first guazza (dew) will enter the water. My friends and I celebrated with an impromptu dinner, everyone bringing something as a surprise for the others. 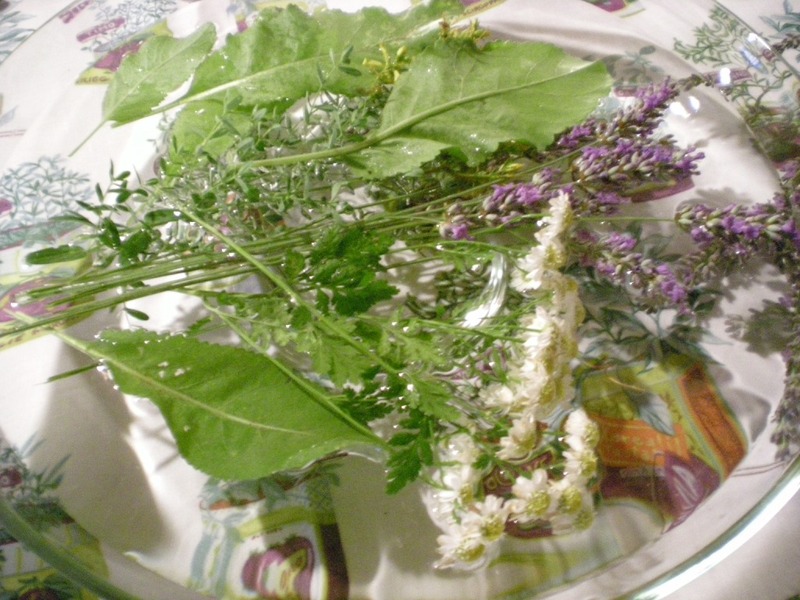 Our hostess Antonella had prepared the special bowl and also decorated the table with a cornucopia of wild flowers and herbs. 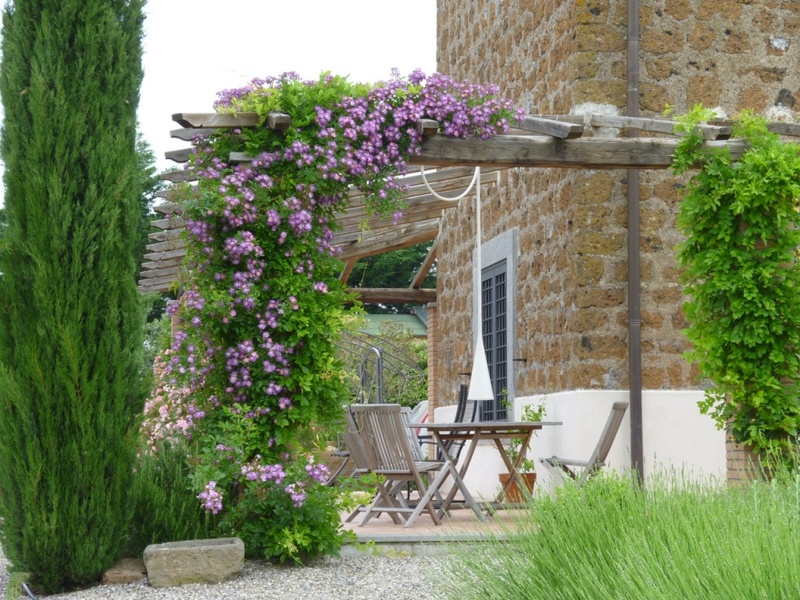 Upon rising the next morning, everyone in the family will wash face and hands with the acqua di San Giovanni gloriously perfumed with the wildflowers, leaves, blossoms, seed pods, weeds, and greens which have been soaking all night. Roses, the yellow wild broom, and walnut leaves dominate the fragrance. Washing in this water is purifying and protective. In many families, a ladle of the acqua di San Giovanni is added to everyone’s bath that day, while infants will be washed directly in the basin before the water is used by others. This tradition is rooted in the solar moment of June 24th, near the summer solstice. On this day, Christianity celebrates the Feast of St. John the Baptist, cousin of Christ, born exactly six months apart. In ancient Rome the fertility festivities in honour of the goddess Fortuna ended on June 24th. Both summer and winter solstices are symbols of passage between the world of space/defined time and the world which is timeless and spaceless, and the tradition of the acqua di San Giovanni certainly has its roots in ancient solstice celebrations. Adapted from Tuesday’s Italian Notebook. 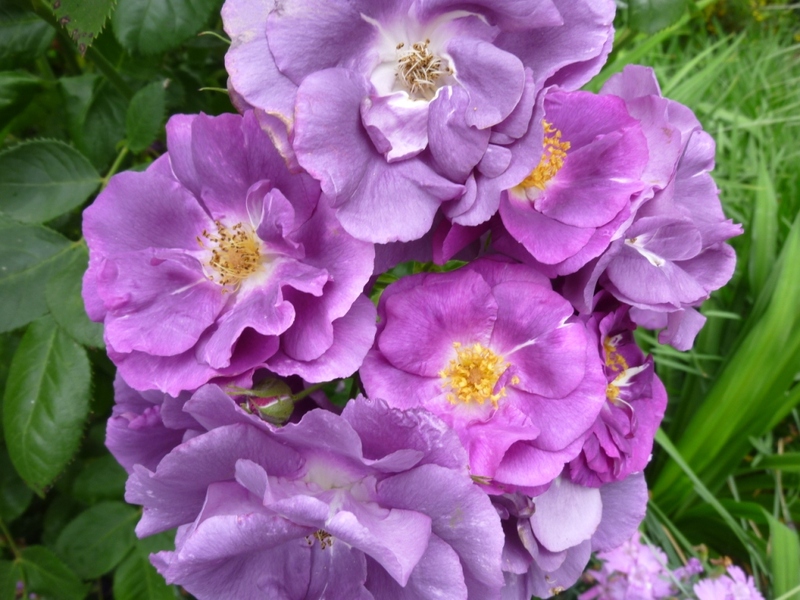 I didn’t manage to take photos last Sunday when it should have been my bloom day. These were all taken on 21st June. It is interesting to see that last month Rosa mutabilis was in full bloom and it is again now, it had a rest of about 10 days to a fortnight with very few flowers but now has even more than before as the plants have put on lots of new growth. 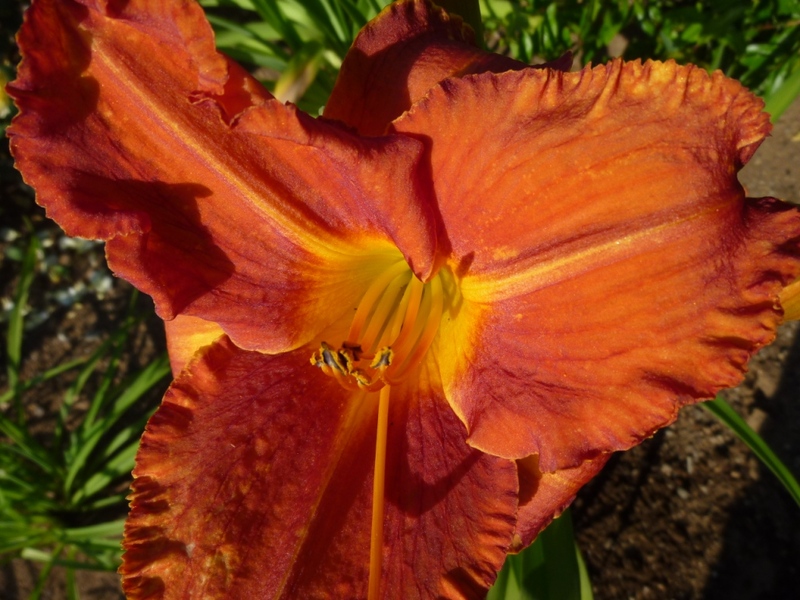 Stars of the garden now are Hemerocallis. I have many different colours, heights and forms, I think they are all beautiful. 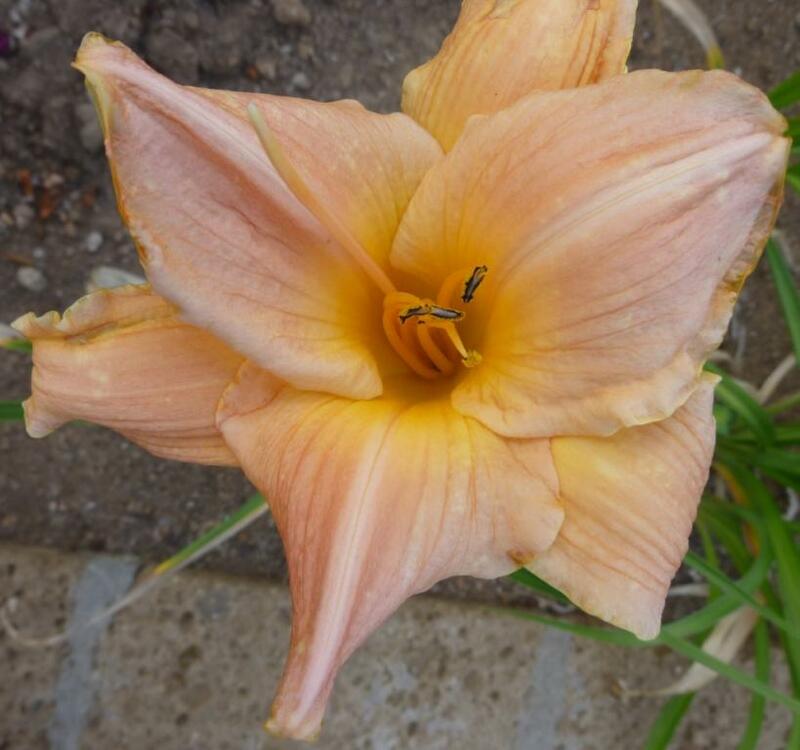 A surprise has been how well Lilly regale have performed in their second year. I just left them in the same pot all winter and began watering them when needed in spring. They are bigger and stronger than last year. 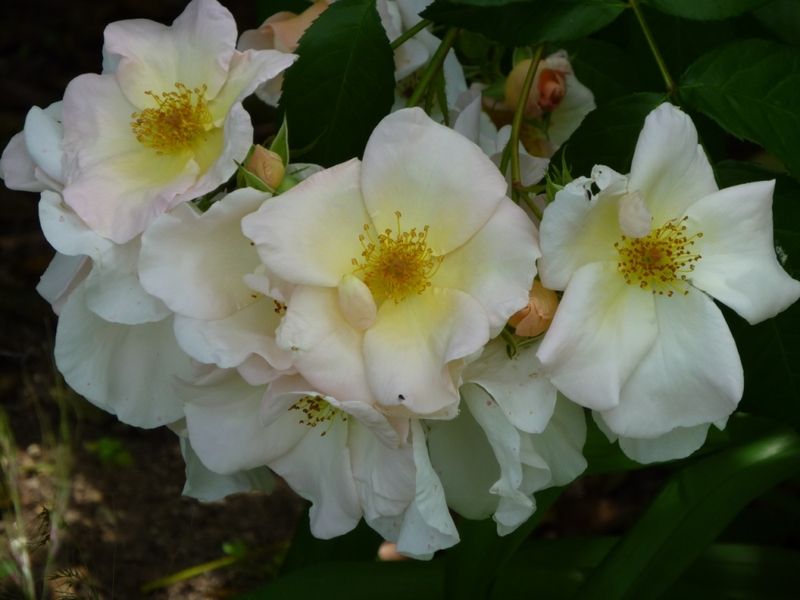 Roses that are flowering well for a second time are: R. mutabilis, R. Molineux, Rimosa climbing and Clair Martin. 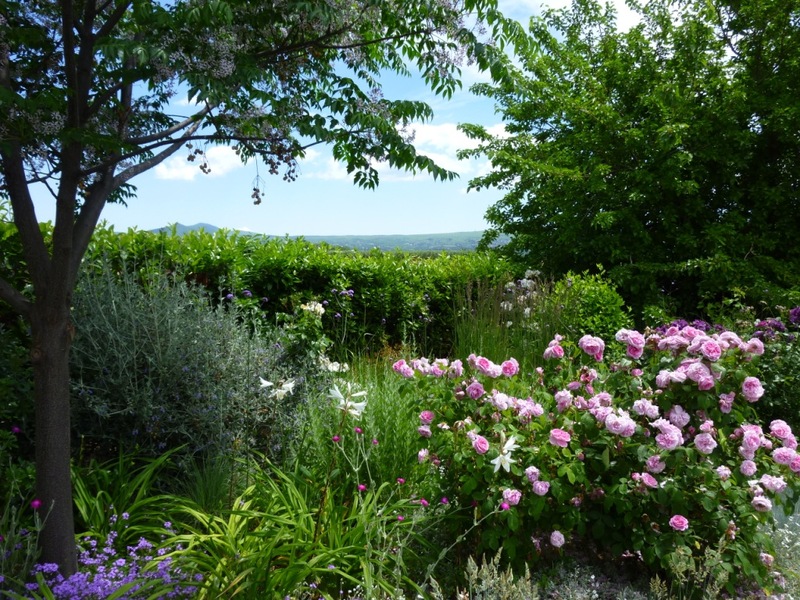 R. William Shakespear, Pierre di Ronsard and Sally Holmes continue to flower. R. Scepter’d Isle is flowering for the first time as the plants on went in during spring and were tiny so are late to flower this year. 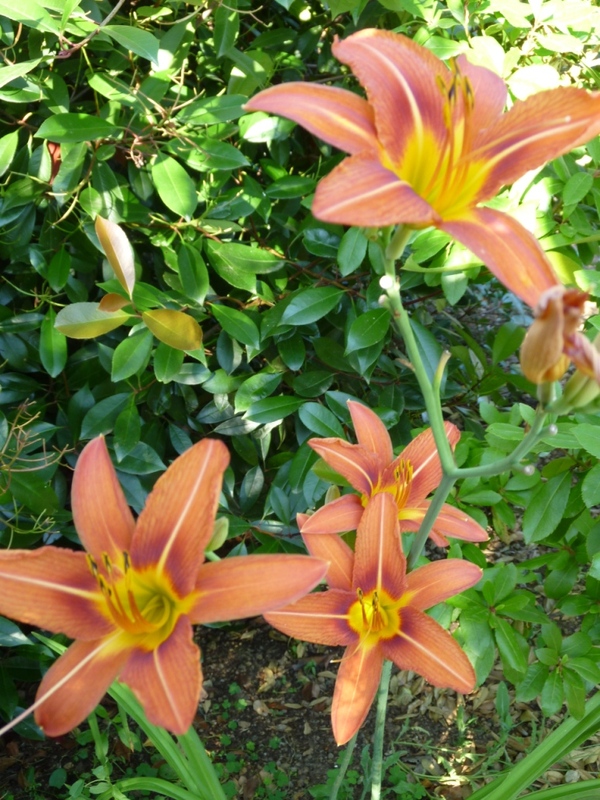 To see everything that is flowering at the moment click on the photo of the lillies. I returned home after the Chelsea flower show to find it had rained almost every day. This week it has rained heavily for two days; and also strong winds, so much so that some grasses were blown over but they are trying to stand up again. 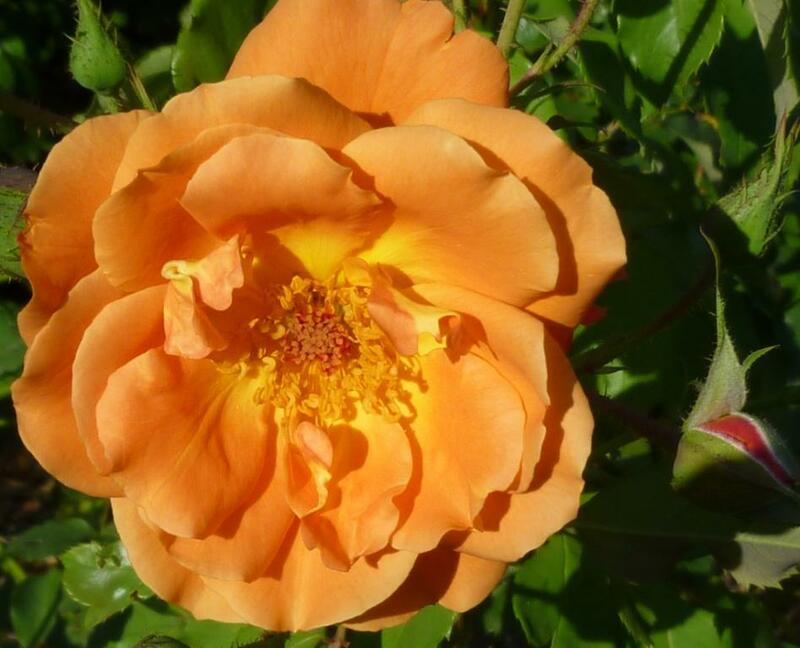 Rosa veichenblau is in full bloom and clothing two pillars with delicate, orange scented flowers, it is already making its way along the large beam that supports the pergola. I dreamed that it would look like this. Rosa Gerdrude Jekyell is also performing wonderfully this year, though if it were not for the rain it would be better still. 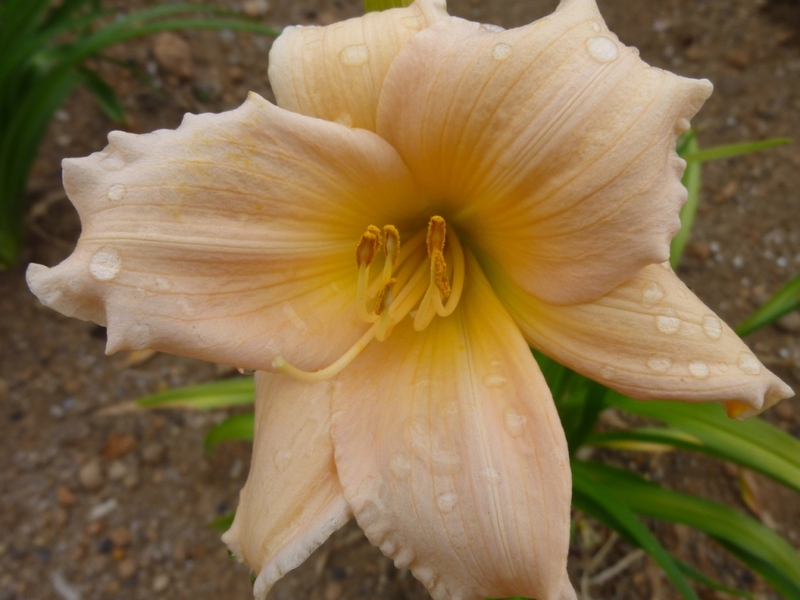 R. Sally Holmes has begun to flower now. Such full flower heads! 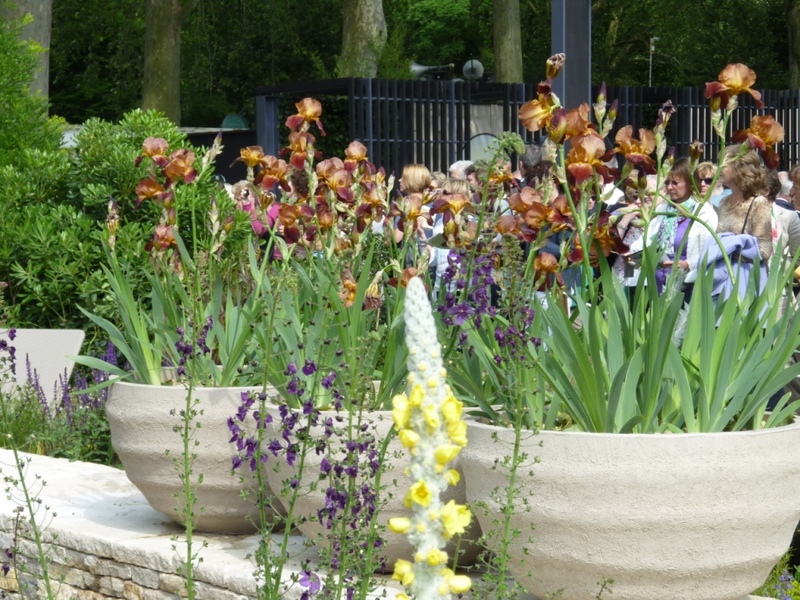 There is always one plant that seems to be in every garden at the Chelsea Flower Show; this year that plant was a brown Iris; i have it too so I think it is I. Kent Pride. I plant it near Nandino as the new spring growth is just the same colour, friends have it with Cotinus, both these combinations work better for me than any of the combinations by the designers at Chelsea. There was much talk on the tv about this being the best Chelsea for some years, but I must say that I didn’t agree. Many of the gardens were so similar to other years with the same plants and no really cutting edge design or inovations. 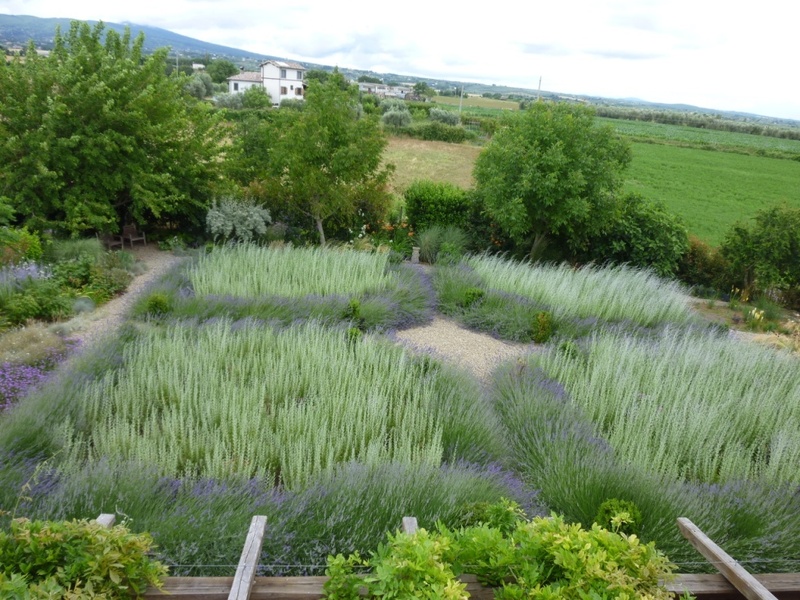 i would have awarded only one or two gold medals in the large show gardens category. 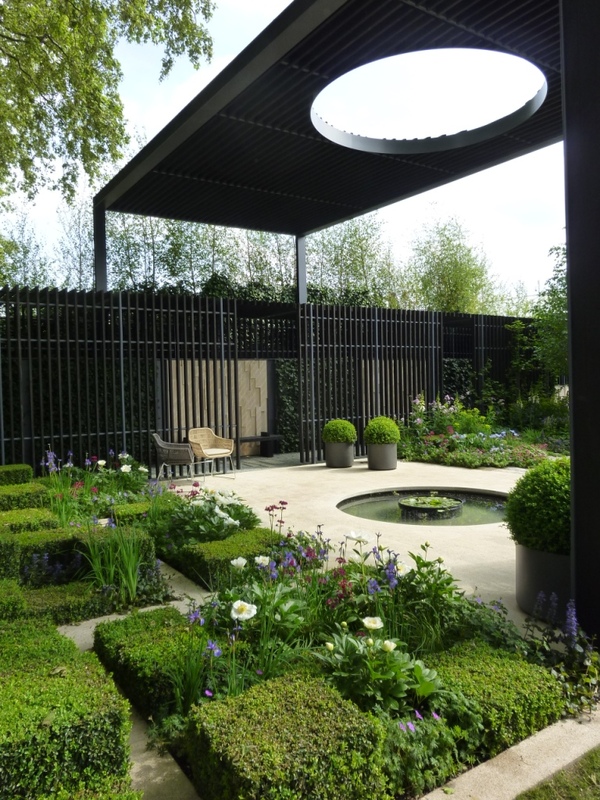 The “best in show” was excellent but my favourite was the garden for Cancer Research designed by Robert Meyers. I thought this garden really proved you could have three quite separate areas including a woodland grove in the space of a show garden so about the size of many real gardens. 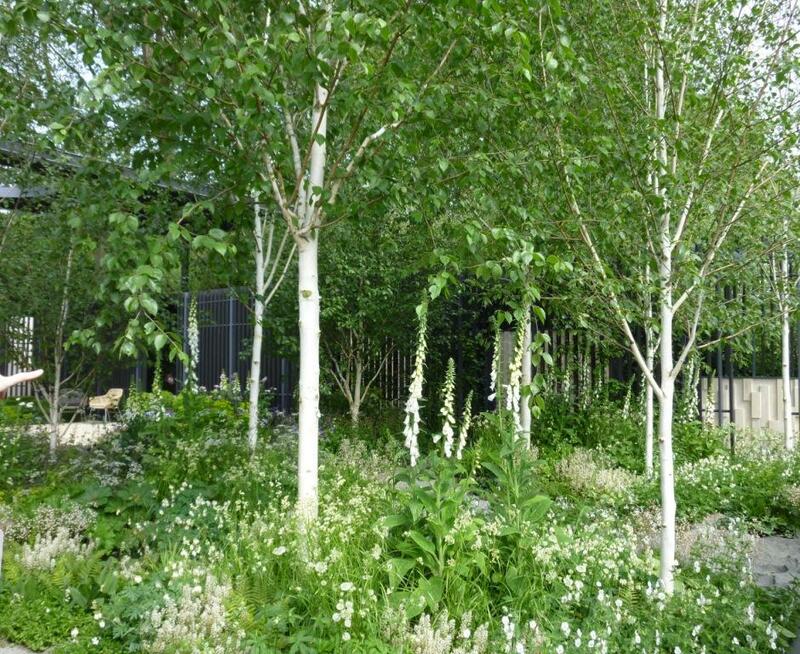 It was beautifully planted in a restrained way with silver birches forming the woodland area and a pergola all rounf the garden for shade; there was formality and natural planting, tradition in that the garden was enclosed by a pergola and modernity provided by an interesting pergola. Of course, Chelsea is always a great place to see lots of tulips and choose colours for next year. But you’ll have to wait until next spring to see them in my garden! I love the box cubes, something I’ve used in designs before now – always a pleasing effect.